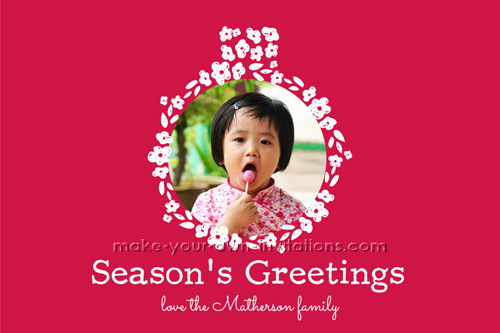 Print these Season's Greeting cards at a photo lab for delivery to your friends and family. you can print as many cards as you wish so you will have enough for every one. This bright and bold red photo card features a photograph place within a Christmas tree bauble decoration. This design can be easily changed with your own wording, the color can also be changed upon request. Available as a FLAT "print it yourself" 4"x6" or 5"x7" jpeg file. Please note here any additional wording or changes to this design - colors etc.